Thanks To Gene Therapy, Monkeys See In Full Color Scientists have used gene therapy to achieve full color vision in two male squirrel monkeys that were born unable to tell red from green. Researchers say the technique could someday be used on people with colorblindness or other vision problems. 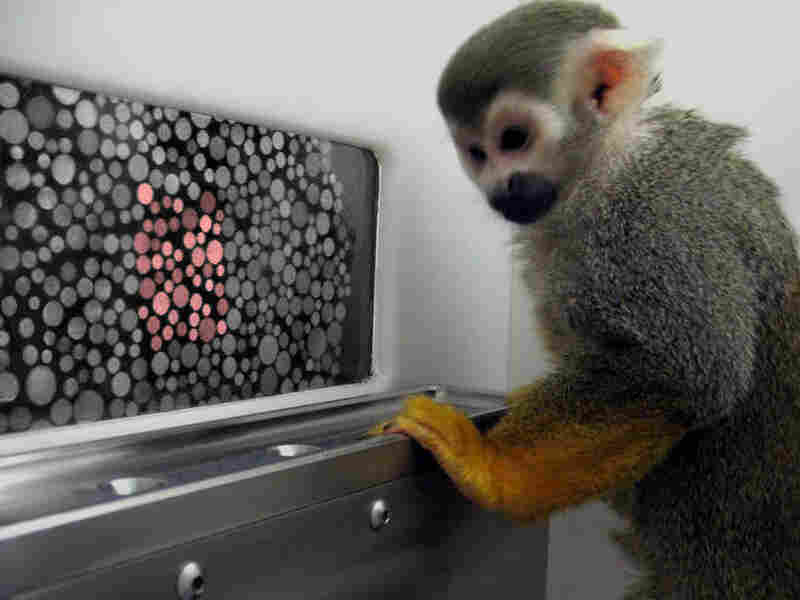 Dalton, a squirrel monkey, had gene therapy to correct his colorblindness. 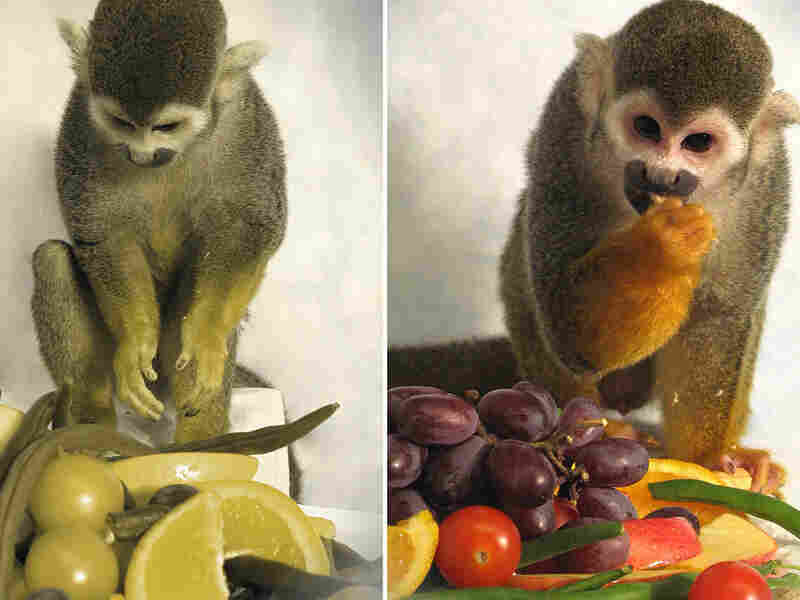 The image on the left is digitally altered to simulate what the scene would look like to a person (or monkey) with red-green color blindness. Scientists have used gene therapy to achieve full color vision in two squirrel monkeys that were born unable to tell red from green. The technique could someday be used on people with colorblindness or other vision problems. The monkeys, named Sam and Dalton, could see only blue and yellow before they were treated. All male squirrel monkeys are born with this type of color blindness. They lack a receptor in their eyes that would let them see red and green. Female squirrel monkeys do have the receptor and can see the whole spectrum. Researchers at the University of Washington developed a gene therapy technique to reprogram some of the color receptors in the male monkeys' eyes. But many scientists were skeptical about the approach, says Jay Neitz, a University of Washington professor of ophthalmology. "I went out and asked all my neuroscientist friends, 'If I do this in an adult monkey, will this give them color vision?' " Neitz says. "And everyone said, 'Absolutely not.' "
Dalton takes the color vision test. The monkey was trained to find blobs of color hidden in a pattern of dots. He was given a drop of juice every time he got the correct answer. The scientists told Neitz that even if the new receptors worked properly, it was unlikely that the monkeys' new eyes would be able to communicate with their old brains. There would be no pathway to carry the information about red and green to the brain, or any circuitry to process it. Neitz and his team tried the experiment anyway. Dalton — named after John Dalton, the British scientist who originally described colorblindness — got treated first. For several months, there was no change. Every day, Dalton tried to win an extra juice reward by searching for a red or green target on a computer screen. And every day he failed. As time passed, Neitz says he got anxious. But he wasn't surprised. Previous experiments had shown that it took about five months to reprogram a critical mass of receptor cells. Then, at just about the five-month mark, Dalton started hitting the target every time. "At first we told ourselves, 'You know, maybe he's just guessing really well today or something,' " Neitz says. "But over a few days, it became clear that he wasn't guessing. That floored us." Later on, the other squirrel monkey, Sam, would have a similar epiphany. Neitz says both monkeys have seemed pretty pleased with themselves ever since. "It's just like a kid that goes in, and they don't want to get wrong answers on a test," he says. "They're very happy to be straight-A students now. Scientists who study color vision are calling the story of Sam and Dalton, which appears in the journal Nature, "dazzling" and "surprising." Gerald Jacobs, a research professor at the University of California, Santa Barbara, says it's remarkable that the technique worked at all on an adult animal. Earlier research had shown that, after childhood, the brain loses much of its ability to incorporate new types of visual information. But Jacobs says the adult brains of colorblind monkeys appear ready to receive new input about color. He says this may be because primates, including humans, have a pathway from the retina that is "almost designed to extract color information." Robert Shapley, a professor at New York University's Center for Neural Science, says what amazed him was how quickly the monkeys' brains responded once the reprogrammed receptor cells began working. There was "almost no delay," he says. "That was really striking." The results bode well for people with colorblindness. "There's no reason to think that these monkeys and humans are dramatically different in the way they are interpreting color signals from their eyes," Shapley says. Researchers say this sort of gene therapy may eventually be used to treat a range of vision problems, not just colorblindness.